PULL ON WITH A SIDE ZIP. STILLETO HEEL WITH A SIDE BUCKLE TRIM. GREY COLOUR. UK6 EU39 US8. Irregular Choice. High heeled calf-length boots. Platform soles and 5" heel. Dark brown faux leather with orange stitching. In very good, used condition. I love them but sadly can't actually walk in them! Ladies Lovely Stilleto Soft Top Boots. Very nice quality item. Designer GIANMARCO LORENZI beautiful leather boots Size UK 7.5 EU 41 BN Amazing! Designer GIANMARCO LORENZI beautiful cream & brown leather mid calf/ankle boots. Size UK 7.5 EU 41. Leather lined & soled. Seriously expensive when bought! Made in Italy. Faith Black Boots Size 4 37 . Condition is Used. Dispatched with Royal Mail 1st Class. Great condition. Gorgeous black suede leather Newport News mid-calf height, laced stiletto heeled boots. Heel is 4” (10cm) high. US size 10M (UK size 7-8, standard width fitting). For reference, I am a slightly wide 6E and they fit my feet width wise, just a bit long. river island Western Leather Boots Size 5. Condition is Used. Dispatched with Royal Mail 2nd Class. Stunning DUNE Tan Leather Pull On Fastening Mid Calf Boot Size 4/37 Exc!! They are perfect for dressing up with many style, for special occasions,formal,casual,party,work and perfect for any occasions. River Island Boots - Size 6. Condition is Used. Dispatched with Royal Mail 2nd Class. STUNNING IRON FIST TIGRE AND BUNNY STUDDED COWBOY BOOTS BLACK. Absolutely stunning Ladies black boots size 7 VT Collection faux suede stud detail . Condition is New with box. Sadly too big for me and left it too late to return, but absolutely beautiful Boots! Lovely Ladies Fashion Union Black Faux Suede Fringed Stiletto Boots. Super stylish, can be worn with so many outfits. A great wardrobe staple. Fantastic condition as only worn once! Best Quality. New look Black calf boots wooden stiletto heel size 5. Condition is Used. Dispatched with Royal Mail 2nd Class. New look Black calf boots wooden stiletto heel size 5 Lovely boots with slight damage as shown in the photo’s. unique wooden studded heal. Looks great with skinny jeans. Happy bidding, please pay within 24hrs of winning. Please get in touch if you have any questions. NEW Boxed Aldo "Slowey" Mid-Calf Stiletto Boots (Black Leather), UK Size 8/41. Pointed toe finish, rubber, ribbed soles for better grip, silver pop button fastening at the side for easy entry. Having a spring clear out. River Island Shoe Boots Size 6. Condition is Used. Beige suede with wedge heel and peep toe. Gorgeous boots hardly worn. Size 5. Smoke and pet free home. No returns accepted. More info and pics to follow. Immaculate with box, as evidenced by unmarked soles, only ever tried on. Barely worn (only twice) gorgeous boots. On trend and beautiful with jeans, smart trousers and dresses. Real suede quality boots. STRONG NYLON PULL ON BOOTS. EVERYTHING IS DOUBLE CHECKED BEFORE DISPATCH AND I RECORD SERIAL NUMBERS AND CODES OF PRODUCTS. Failure to do this will result in invalidation of the claim. Genuine leather uppers, in a distressed style with subtle discolouration/scratches. 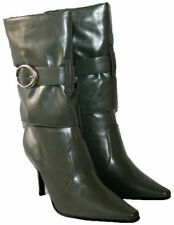 ~ Ladies LovelyStiletto Heel Mid-Calf Boots by Faith ~. Features side zip fastening and pointed toes. 13.5" Height (floor to top of boot).